Small cross-overs are all the rage – let’s have a look at BMW’s entry-level offering in this category. The X1 is BMW’s newest, smallest and most affordable model in their “SAV” (sports-activity vehicle) line-up and it’s based on the 3-series Touring platform. It starts at CDN $38,500 – my Alpine White review vehicle, which included the Premium and Sports packages and power seats, rang in at CDN $42,440. The exterior will look familiar but causes many to do a double-take. It’s a much lower stance than other BMW cross-overs, and looks more stretched out – and maybe like it has a big nose. It’s not a big vehicle, but certainly not tiny either. The surprisingly-low roof is adorned with metal roof rails and a shark fin antenna. The front end drops down lower than expected as well, and looks aggressive, with large kidney-grille openings and a chin spoiler finished with brushed metal. The same metal is used in the handsome trim under the doors and on the back valance. 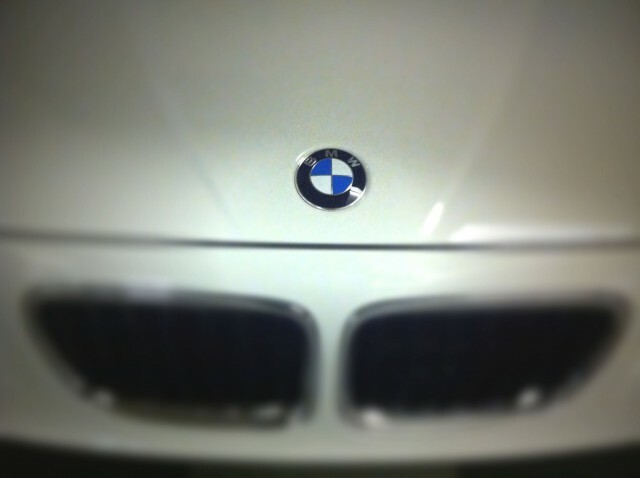 I was surprised at the lack of HID headlights, and the lack of BMW’s signature driving light haloes. The side profile is nice, stretched out as already mentioned, and the belt line sweeps up behind the back doors to complete the small rear window profile. The whole look is finished off with nice rims and reasonably sized rubber. Here’s the big story, since this engine will be powering BMW’s vehicles with the 28 moniker. It hasn’t been a 2.8 Litre engine for a while, but this is a whole new direction. It’s their new 2.0-Litre, twin-scroll turbocharged 4-cylinder. It puts out a solid 241 HP @ 5500 RPM. The stuff that matters for around town is the torque, and that’s where this engine leaves the old, normally aspirated 6-cylinder in the dust. It churns out 258 lb.ft of torque – at a ridiculously low 1250 RPM. Yum! 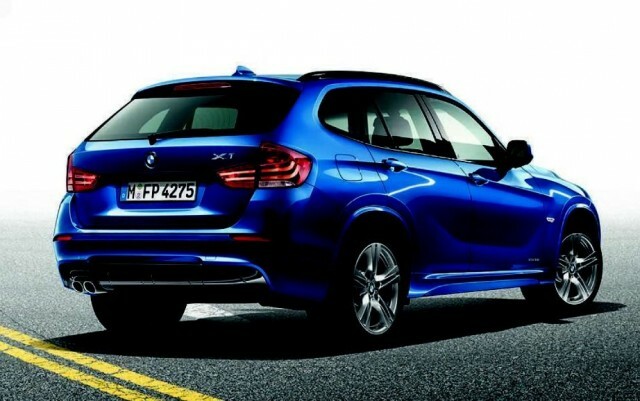 Coupled with BMW’s new 8-speed automatic, the X1 makes the 0-60 run in 6.7 seconds. Fuel economy is also improved, and significantly so. The X1 is rated at 10.2 L/100 km (23 mpg) in the city, 6.5 L/100 km (36 mpg) on the highway, and 8.5 L/100 km (28 mpg) for the combined cycle. I saw around 10.5 L/100 km (22 mpg) driving it fairly aggressively, which is very good. Thank goodness, because it swills premium fuel out of its 63 Litre tank. BMW has long made it clear that they are the driver’s car manufacturer, so let’s talk about that. The X1 is, much like their other non-M SAVs, a significantly less sporty experience than their cars in terms of the drive. It’s only fitting, when you make something bigger, heavier, taller and longer. The X1 is certainly not BMW’s sportiest drive, but it does do well, all things considered. 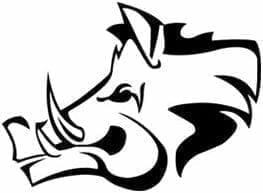 The engine is great, and gives you a happy snarl when you fire it up. I found a little lag when stepping on it, but then it builds momentum with aplomb, surging ahead enthusiastically. To be honest, I think that hesitation is almost more driveline/transmission related than actual turbo lag. I also found that most of that lag can be alleviated by slapping the transmission into sport mode, leaving the engine in the meatier part of the rev range. The hesitation isn’t bad at all, it’s just there. As smooth as the engine is, it’s not as smooth as the old 6-cylinders were. Power is plenty for everyday driving, and once on boost, it pulls happily at any speed. The 8-speed auto is generally very smooth, and seems quite intelligent. Manual mode with the slap-stick or paddles is decent, and quick enough with one gear change – request two gears up or down at once, and it takes a couple of seconds to get there. The ride is sporty, which is my way of saying acceptably firm. It remains firm at all speeds, but is comfortable enough. The handling is good for a crossover – I’d like sharper turn-in, but once it’s into the corner, it’s happy and will slingshot out of it when you step on it. There’s a bit of body roll but less than most of the competition. The all-wheel drive system was smooth and unobtrusive, and effective in the snowstorm I was lucky enough to do battle with – in late April. I felt the steering was alright, but not as communicative as I’ve come to expect from BMW – it was also very hard to steer at lower speeds, such as while parking. The X1 was quiet at all speeds – road, wind and drivetrain noise was very good, and a last-generation BMW 328 owner commented that it was quieter than his car. Visibility out was very good, except for one area – the belt line that sweeps up so prettily at the back always made me feel there was a car there when doing a passenger-side shoulder check. 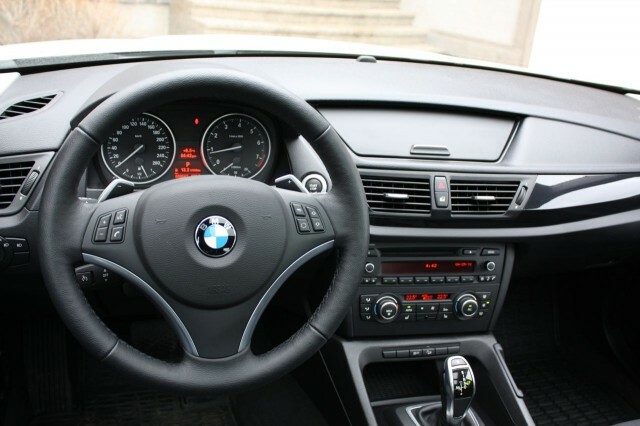 The interior is all business – typical BMW. This car was all black, which makes it even more serious. Materials are nice, but not fantastic. Some soft-touch surfaces, mixed with hard plastics and black piano gloss trim pieces. The seats are leatherette. While they are very comfortable, and have excellent bolstering, it seems a bit cheesy to offer vinyl seats at this price. I know “leatherette” is the new thing, but I prefer real dead cow hide in my cars when I’m dropping $40K or more. The black leatherette is matte finished, and because of the lack of sheen, it looked almost more reptilian than bovine. 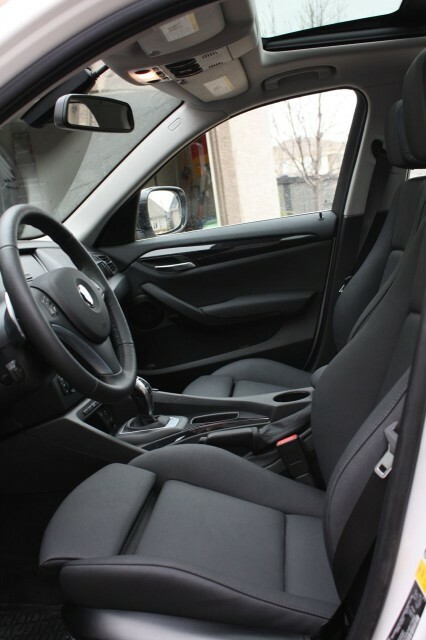 Regardless, they’re nice seats – heated and power adjustable, with a memory setting for the driver. In front of you is a great manually adjustable steering wheel with a fat rim and controls for media, phone and hands-free operations. Sitting behind it is a set of BMW’s highly-readable, clear gauges and a driver information screen, which shows you fuel economy and range, and average speed. Headroom is very good, and the rest of it is roomy enough – not large, but not tight. The center stack contains the audio system and a dual-zone, automatic climate control system. The console contains the shift lever, a parking brake lever and an armrest. The stereo, while very simple and saddled with a poor user interface, sounds incredible – crisp highs, full bass, excellent balance. Sources are AM, FM, CD, auxiliary and USB. The auxiliary, USB and 12 V plugs are at the bottom of the center stack. Of course you have power windows, door locks and mirrors. The steering wheel is heated, and you have automatic headlights. The ignition is push-start, with a silly caveat I’ll tell you about in the Nitpicks section. Overhead, you’ll find a huge, panoramic sunroof – the front section tilts and slides. Though you’ll find 3 seats, 3 headrests and 3 seat belts back there, and the center seat isn’t horrible, it’s realistically seating for 2 adults because of the very intrusive driveshaft tunnel on the floor. However, my 3 kids fit fine and were very comfortable. Headroom is outstanding back there – legroom and knee room are pretty good. The backs of the front seats are hard plastic panels, which means there are no map pockets, and it would be uncomfortable if you’re of the long-legged persuasion. The seats themselves are comfortable and recline to several positions. It feels airy and probably roomier than it is thanks to the large sunroof overhead. You’ve got door bins with bottle holders, and 2 LATCH connectors for children’s seats. The LATCH connectors are hidden with weird plastic lids. There is a 12V plug at the back of the center console. 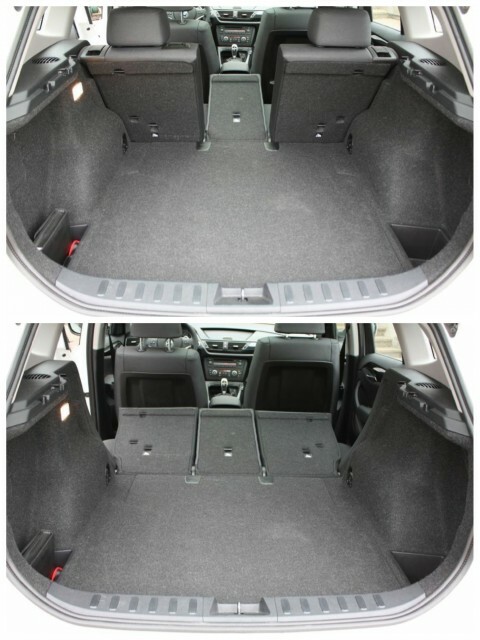 The X1’s cargo space is reasonable at 14.8 cubic feet. 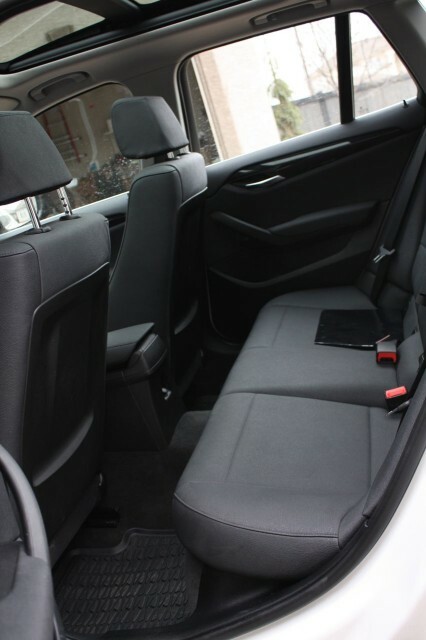 I loved the flexibility of having rear seats that fold in three sections – fold all three 40/20/40 sections flat and you’ve got a versatile 47.6 cubic feet to work with. You’ll also find a 3″ deep under-floor storage compartment, 4 heavy-duty tie-down loops and a solid tonneau cover that swings up with the trunk lid. In the front, you’ve got nice door bins with bottle holders, a deep open bin at the bottom of the center console, a large lidded bin in the dash where BMW’s widescreen display usually sits and a smallish, strangely compartmented bin under the sliding armrest lid as well as a glove compartment. A single cupholder resides in the console. OK, let’s talk cupholders. BMW has never taken cupholders nearly as seriously as we do in North America, and I pointed that out in my review of the 328. I found a small, spring-loaded metal cover over a slot on the right side of the center console and finally figured out that’s where BMW wants you to slot in their additional cupholder. Words can’t describe how dumb this solution seems, so I’ll leave you with a picture to ponder this insanity. The FOB must be inserted into a slot – much like a key would – before the push-button ignition works. So why bother with a button if you have to basically put a key in anyway? 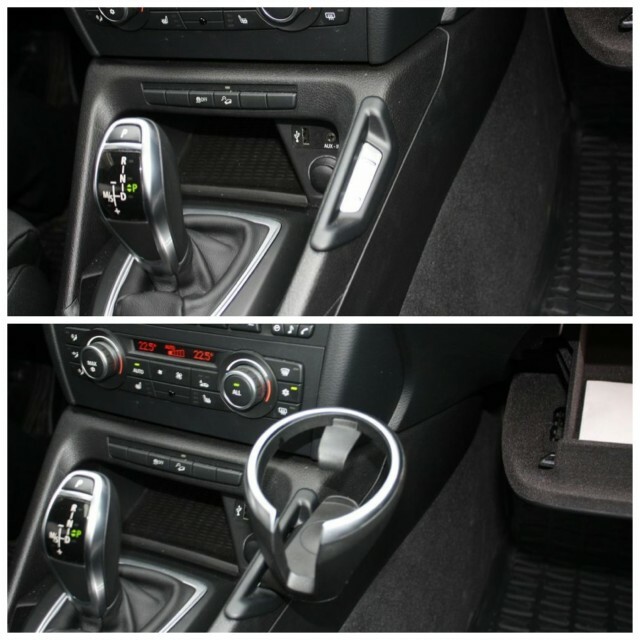 I wasn’t a fan of BMW’s new shift lever – I’ve never met someone who says they like it. It pivots around a center point, requiring you to depress a side button to snick it forward into reverse (totally opposite to what you’ve been doing for your entire driving career) or backwards into drive. To put it into Park, you have to press the “P” button on top, instead of moving the lever. I didn’t even remotely get used to it after a week. Other nitpicks are more regarding what’s NOT there – especially at this price. Something that costs over $40,000 should have lit vanity mirrors, HomeLink garage door openers, a back-up camera and Bluetooth streaming for the stereo. Many vehicles that cost slightly more than half as much offer these things, often as standard equipment. Oh, and no satellite radio standard. Whaaaat??? The X1 has a stellar dead pedal, and I loved it. When you set your cruise control, a cool little marker needle shuttles around the outside bezel of the speedometer and stops at the speed you’ve set your cruise at. Totally unnecessary, but totally awesome! I enjoyed my time with the X1. It’s a great little crossover, offering more space and utility than I thought it would, and putting down very respectable numbers in terms of performance and fuel economy. I think the biggest barrier the X1 is going to run up against is the perception of value. As noted, I’m looking for some more goodies when I buy a vehicle in this price range, and although it offers a lot of neat things (hello, heated steering wheel! ), I’d prefer to see it have the basics down first, as per the nitpicks section. Those are glaring oversights, and shouldn’t require a step up in option packages – not at this price. I give the X1 a solid 7 out of 10. In the end, I wish it would give me a little more for my dollar – then I could enjoy the great performance and fun ride a little more instead of being a little pissed that the dude beside me in the CR-V has a back-up camera. And paid $10,000 less. If the X1 were $3000-4000 less, or offered more standard equipment at this price, I would have given it a 7.5 out of 10. WAF (Wife Acceptance Factor) was quite high. She liked the way it drove, and the space it offers inside. She didn’t like the goofy shift lever nor the finnicky user interface on the stereo. So in my books, the biggest strike against it is value. It’s not a terrible value, not at all. This is, after all, a BMW and is to be considered a premium crossover. But you can buy vehicles for less that offer more. They don’t say BMW on them and they don’t drive like the X1 to be sure, and those two things are what a lot of shoppers are looking for. If you don’t mind spending a little more and getting a little less in terms of tech and convenience, you will still end up with a fine driving machine that offers a chunk of utility and versatility. It also might be the cheapest way to get into a BMW, if that’s what you’re after. Call it a gateway drug and drop me a line when you upgrade to your M5. Hi-yoooooo! Disclosure: Vehicle was provided by BMW.